devorelebeaumonstre.com | Pittsburgh, PA | Fashion & Personal Style Blog by Stacey Belko: shopbeaumonstre giveaway. 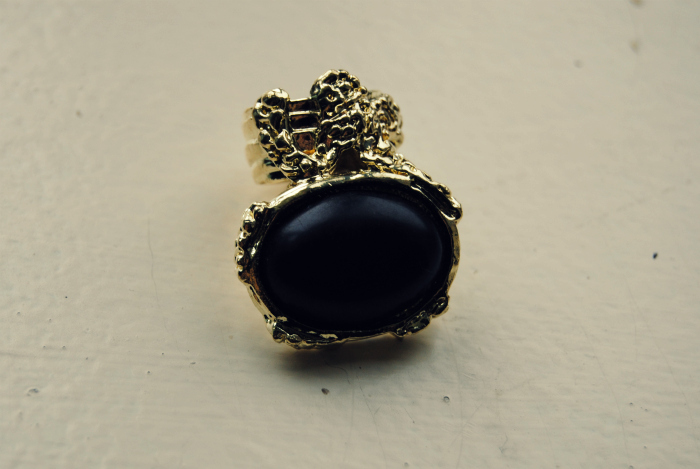 Black 'arty oval style' ring from shopbeaumonstre for a Black Friday giveaway.. hollerrr. & a lot of the jewelry in my shop is ON SALE now - Monday so check it out. Follow my blog via Google Friend Connect & Bloglovin'. Leave a comment with your e-mail address so I can contact you if you win. EXTRA ENTRY if you tweet or facebook post "GIVEAWAY from @StaceyBelko for an arty oval style ring http://www.devorelebeaumonstre.com/ ". Giveaway will be open until Thursday, December 1st & a winner will be chosen using random.org. I also followed on bloglovin. is my email my username there? i follow you on google friend & bloglovin! im in! was already following you with GFC,and now bloglovin too! Following you, thanks for this giveaway - that ring is beautiful. I already follow on both! ommg i love it, i adore it, i want this ring! Snazzy ring. I dig that. I've always wanted a similar ring, the black version looks divine ! Also tweeted the giveaway ! Love that ring! I follow your blog. Love your style. Thanks for checking out my blog. Would love for you to follow. Am following you now. Love your shoe collection! Nice work! oh. extra, extra! i tweeted too. I love, love your blog. And this ring is stunning. the ring is so gorgeous!!! it will fit perfectly into my collection!!! followed!! Hey, do you like living in Pittsburgh? ? Is it fun?? I'm thinking of moving there. I follow your blog on google...and I LOVE that ring! Hi! You didn't mention if the giveaway is international or not, but I really hope it is, because that ring is beautiful! The rong is fabulous!So glade you have invited me to participate. I am following as Eugenia G.
already follow you on bloglovin'! You baited me with your 2 word comment on my blog...it worked! Ha. Here I am :) I follow via gfc and bloglovin. Going to give you a twitter shout in a minute. Ps: one of the stones on the knuckle ring I bought from you a while back fell off because I dropped the ring! I think I'm going to get crafty and just glue it back on. Lovely give away and beautiful ring! Definitely going to need the turquoise ring! To die for! Shared on my fb's profile: http://www.facebook.com/profile.php?id=100002370347028 !!!! I was so happy about your comment and i must say your blog is grandious! i follow on bloglovin and gfc! Awesome blog & Giveaway! I am a new follower! Thanks so much! Great giveaway! What an amazing giveway ! I'm now following you via Google Friend + BlogLovin' :D.
& Cross my fingers so hard with hope. + I tweeted about the giveaway, my username is @AudreyMarianne ! I'm following you also with Bloglovin'. such a beauty......... love it! Following on Bloglovin and GFC....great giveaway hun!! Check out my INTERNATIONAL COASTAL SCENTS giveaway, if you haven't already! Wonderful giveaway! The ring is gorgeous. follow via GFC and Bloglovin', of course. i hope i'm not too late for this amazing give -away! Wow!! This is so lovely!! I follow you on GFC and Bloglovin'. Thanks for the heads-up on the contest! I'm a new GFC follower- love your blog! Thanks for this lovely giveaway!! Hi !! I love your blog !! hey, nice giveaway, the ring is gorgeous! Thank you for commeting on my little blog. You have a great look. I am following on google friend finder. Enter me please, love this ring so much!! followed on Google and Bloglovin'! love your blog, thanks for the rad give aways! Oh I missed it! Sorry, I'm sure the winner will be partying for us all anyway.